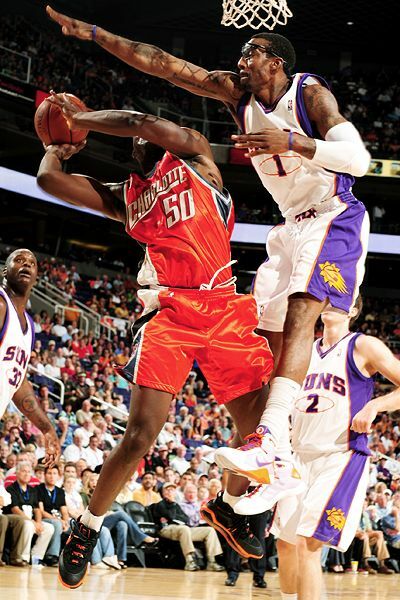 Can Amare Stoudemire become a real life James Worthy [Lakers’ HOFer] clone this season for the Phoenix Suns? Goggles alone cannot make Tha Man. Only if Shaquille O’Neal can also transform himself into a working version of a venerable Kareem Abdul Jabbar [the Lakers’ other bi-spectacled HOFer], circa 1987-1988, who regularly played 79-80 games for the LakeShow during the twilight stages of his historic NBA career, while still putting up solid numbers like these. Then, again … considering this is a League Where Amazing Happens, on the regular, and Anything Is Possible … who’s to say what lies ahead this season, in the NBA, when The Game Happens Here. The fundamental inequities which exist between the rosters of these two teams were on full display in last night’s exhibition game. * Replacing A-Parker with Jason Kapono. After Jason Kapono made 2 Free Throws to put the Raptors ahead, 72-70, the Lakers closed the quarter with a 10-4 run which put them up, 80-76. * Replacing J-O’Neal with Chris Bosh. LAKERS – Farmar [PG], Ariza [OG/SF], Walton [SF/OG], Odom [PF] & Mihm [C]. Without bringing Kobe Bryant, Pau Gasol, or Andrew Bynum back into the game, the Lakers then outscored the Raptors in the 4th Quarter, 32-13, to seal their victory. 2. To be a ‘legitimate’ contending team in the Eastern Conference this season. I) When Jose Calderon is not in the game, the Raptors do not have a capable back-up Point Guard who they can use to run their team against a high calibre opponent. II) When some combination of Chris Bosh, Jermaine O’Neal and Kris Humphries are not on the court together, the Raptors are incapable of rebounding the ball in a way which is consistent with being a legitimate contending team in the NBA … given the deficiencies of their back-up players, like Andrea Bargnani [C/PF], Jason Kapono [SF/OG], Hassan Adams [OG/SF] and Roko Ukic [PG], in this specific area of the game. as well as, the other 2nd & 3rd tier teams that are in the ‘chase pack’ alongside Toronto. Q1. What are the reasons you have lost your mind and predicted boldly that the 2008-2009 LA Lakers will win 70+ regular season games and capture the NBA Championship? A1. If you must know, it’s a two-part answer. The Lakers have done a solid job re-assembling a 1st-class roster of highly talented, athletic, skilled, complimentary players around Phil Jackson & Kobe Bryant, two expert practicioners in their respective fields, i.e. ZenMaster Warlord, and his Most Trusted Samurai. On the heels of the experience this team gained last season, losing in the NBA FINALS, it is now poised to strike back with lethal vengence, this season … to provide the 10th NBA Title, as a coach, for their venorable Sensai; and, the 1st Ring (overall) for his protege, Black Mamba, unaccompanied by his former partner-in-crime, the Biggest-Shogun-of-All-Time. According to these eyes, this is THE season for these Lakers to make history, as a group. Here & Now. Next season? Who knows where Phil Jackson is going to be, at his age? Or, Lamar Odom? Or, Derek Fisher? Or, Tex Winter? Or, the rest of the Lakers’ extended family. The time for this group, to ‘Be In The Moment, as One‘, is NOW. NBA.com: What are your goals for the upcoming season? Greg Oden: Just to win. To try to get out there and help my team win as much as possible. I’m not really worried about individual stats. For me, if my team can make the playoffs or we can win a lot more games than we did last year, then that will satisfy me. and this corner just happens to believe that he is going to prove to be, in the long run, the closest thing this League has seen, in the LAST 40 YEARS, to the re-incarnation of The Great Man, himself … Mr. Bill Russell (figuratively speaking, of course, as the original incarnation is still going strong!) combined with Wilt Chamberlain (at his most powerful best) … in terms of his Commitment to REBOUNDING, Defense, Team & Individual Offense AND his overall attitude toward The Game (specifically) & Life (in general). NBA.com: You got to know the greatest big man in Blazers history, Bill Walton, a little bit. What advice has he shared with you? Greg Oden: He’s just telling me if you go out there and play, you don’t have to worry about what people say about you in the news or the media. Just go out there and play your game and have fun with it. It’s just a game. You’ve got to understand that you’re a rookie. Don’t put any pressure on yourself that isn’t needed. If the Lakers DO NOT win the championship this season … each year that goes by it is going to get more and more difficult for them – and the other elite level teams in the Western Conference – to defeat the Portland Trail Blazers, anchored in the middle by Gregory Wayne Oden, Jr., over the course of the next decade, or so. When you find yourself standing squarely between a Rock (i.e. last year’s group of Boston Celtics) and a Hard Place (Greg Oden’s Portland Trail Blazers for the next 10-15 years) … it can do wonders to create an extraordinary sense of urgency, and R.E.S.P.E.C.T., for the moment at-hand. Carpe Diem! … which will NEED to strike while the iron is hot … and, before the sparks ignite, full blown, up the Pacific Coastline, in the Emerald City. Straight goods … from the best player, on what will be the best basketball team on the planet this season. If you flipped TJ Ford for Steve Nash (let’s say in a fantasy world) … do you think the Suns would stand a snowball’s chance in h*ll of getting past the Spurs this year? How about the Raptors vs the Magic? then you’re beginning to see that the major problem with this team is that … unlike what happened in Phoenix when Colangelo, Jr. COMPLETELY LUCKED OUT that Steve Nash WANTED to return to the Suns when Mark Cuban cut him loose BECAUSE NASH’S WIFE & KIDS ALREADY LIVED IN THE PHOENIX AREA (not because BC is a top notch GM who knows what he’s doing) … THERE IS ONLY ONE STEVE NASH AND HE ISN’T PLAYING FOR THE RAPTORS, JUST YET. Steve Nash is/was the architect of Phoenix’s rise from the ashes … which Bryan Colangelo orchestrated with their once-proud team … no one else. Because Steve Nash wanted to live in Phoenix, he signed with the Suns when Cuban said, “Thanks but no thanks, Stevie boy, I don’t think you’ve got what it will take to Win a Championship for me with the Mavs, at the price you’re asking.” FULL STOP. Because Steve Nash is the best ‘Pick & Roll/Pop’ PG in the History of the NBA (so sayeth an authority like Mark Jackson, during the Suns/Spurs Game 2 match-up) … when Colangelo fired Frank Johnson (who he had previously picked to run the Suns) and appointed Mike D’Antoni … IT WAS D’ANTONI WHO INSTALLED THE SUNS’ 4 OUT/1 IN OFFENSIVE SYSTEM, tailored specifically for Steve & Amare (who is the perfect under-sized but super athletic Center to run that system) and deserves 2nd billing on the Suns credit roll for their resurgence as a first-tier franchise in the NBA. If not for Colangelo’s decision NOT to re-sign Joe Johnson … Phoenix might well have its 1st NBA title already. Then … “when the going actually got tough” in Phoenix and daddy was out as the principal owner … that’s when the ‘Golden Boy’ decided to ‘Bolt the Ship’ and head for greener pastures … in mid-season 2006 (think about THAT for a second or two) … for the comfy ‘international’ confines in The Great White North, with free reign to call the shots AND a Big Ticket contract. Want to know THE reason this version of the Raptors isn’t quite ‘tough enough’ to get the job done in the post-season? When a fight breaks out (like it did in Phoenix) … what does a really tough ‘hombre’ decide to do … FIGHT or RUN? 7 Seconds or Less … is the Coward’s way to play NBA hoops … and will never ever be rewarded with the championship. not an “offensive philosophy of 100 shots per game”. MLSE does not know what it’s doing AND should not be in the business of running ‘pro sports teams’ in Toronto … cause they KEEP HIRING THE WRONG PEOPLE to head up their basketball & hockey operations (e.g. see the current debacle with Anaheim’s GM, Brian Burke). As the old Chinese Warlord could tell you from his personal experience … the strategy that works best when training an army of men … is decapitating the heads of the two most favoured concubines appointed to lead the masses in the first place. It ain’t rocket science, to be sure … but, dem Chinese Warlords sure did know what they were doing … when it came to BUILDING & MAINTAINING their Dynasty. Food For Thought … as always. In Peace, Victory & Excellence.